On January 24 at the the World Economic Forum, the Ellen MacArthur Foundation launched Project Mainstream, a collaborative project involving large enterprises capable of bringing the circular economy from small-scale pilot projects to the mainstream of business. 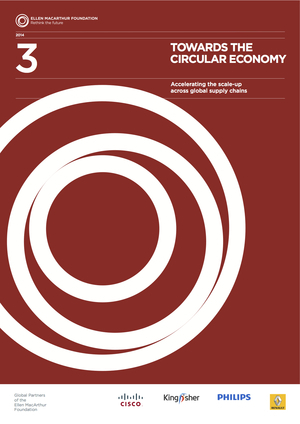 The press release states: “With commodity prices almost tripling in the last 10 years, businesses and governments are now recognizing this as an opportunity to manage input cost volatility, as this approach decouples economic growth from finite supplies of primary resources.” Towards the Circular Economy, the report which accompanied the launch, finds that “over US$1 trillion a year could be generated by 2025 for the global economy and 100,000 new jobs created for the next five years if companies focused on encouraging the build-up of circular supply chains to increase the rate of recycling, reuse and rem anufacture.” As an article in The Guardian points out, this initiative intends to tackle the scale and complexity of global supply chains-as well as a crucial stumbling block in recycling – the toxic contents of some products. Canadian readers will be familiar with these concepts from the 2013 report, Closing the Loop: Reducing Greenhouse Gas Emissions Through Zero Waste in BC, which focused on the benefits to consumers and the environment. The Ellen MacArthur Foundation has published reports on the Circular Economy since 2010. This entry was posted in Uncategorized and tagged Circular Economy, Davos, Ellen McArthur Foundation, Green Manufacturing Processes, Job Creation, Recycling, Supply chains, toxic chemicals, World Economic Forum by elizabethperry493. Bookmark the permalink.